TestDEN.com has a new, friendlier look. It took us a while but we finally launched the new website. Thanks to all our customers and partners who gave us their input these last few months. Separate sections with lots of info and free demos for TOEFL, TOEIC, and Accent Reduction. 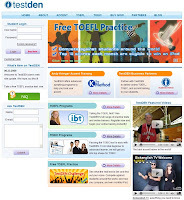 Easy access to TestDEN Challenge for free TOEFL and TOEIC tests. Revised 180-day training bundles for TOEFL and TOEIC that offer extreme value to students. A completely revamped TestDEN Partners section with descriptions of all TestDEN services and details about how to become a TestDEN Partner.